Bang… went the huge bell at a distance. I shuddered behind the wheel. However, I went on and the screams started getting louder. I could see a few people running towards my jeep at a distance. The closer I went, the clearer I could hear their screams. Bhaago… Bhaago.. Sher.. Bhaago.. Even before I could turn my vehicle around, a huge tiger jumped on to the vehicle. Thanks to the old model jeep that I rented, it was more like a pick-up. I had a cabin for myself, covered with a leather cloth and the rear portion opened up, probably to accommodate luggage. This huge beast, started pounding on to the leather strip and in two or three punches, tore it off, exposing me behind the wheel. I managed to jump out of the vehicle by then, and started running. This beast, took its time to jump out of the carriage behind, but then it was fast enough on the dusty soil to reach me. It sprang upon me and I lost balance and fell down like a dead tree. It jumped on to me and I could feel the weight on me. And suddenly, BANG.. 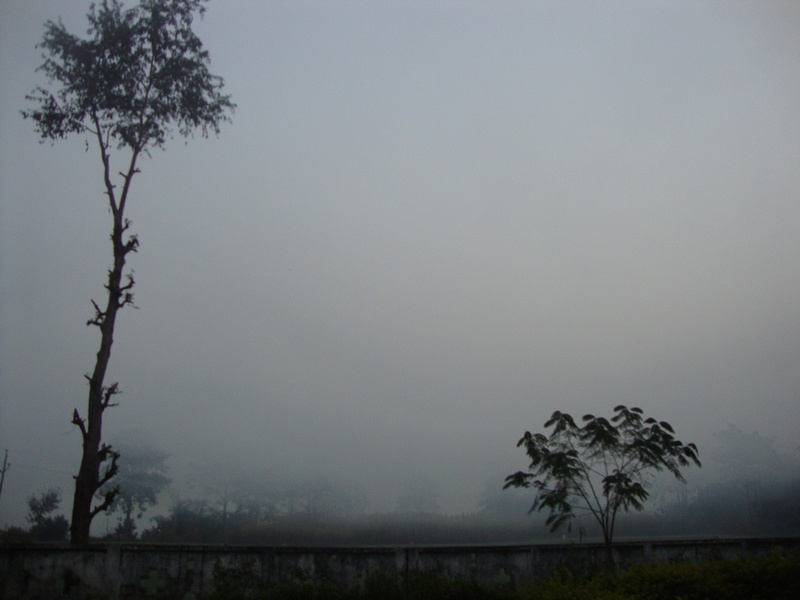 I found myself awake in my bed, sweating amidst that cold foggy night. 4:30 AM it was. Cursing my ambitions, and thanking my stars, I dozed off again, this time, hoping not to see any such thing again. 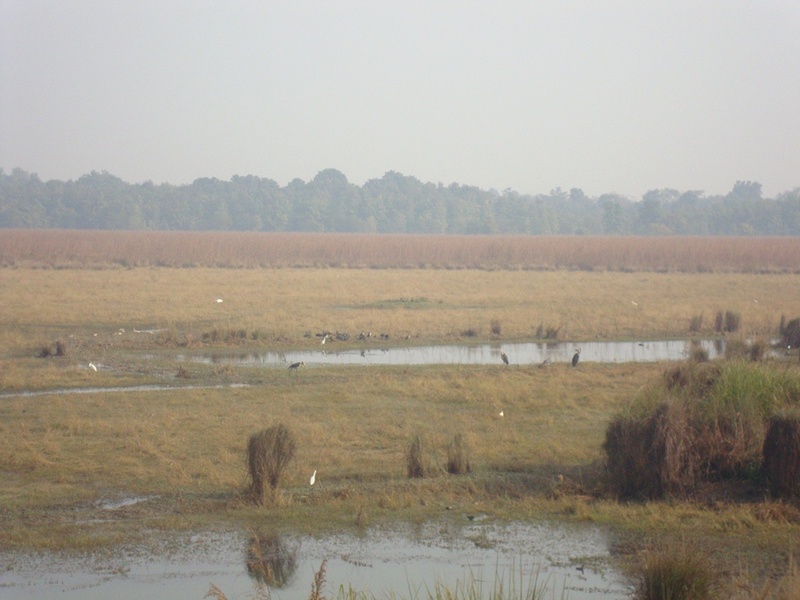 So, we reached the Dudhwa National Park Admin Office by 6:30 A.M. and enquired if we could take our own vehicle for the safari for which they said yes. However, after coming out, we discussed, debated, disagreed, on a lot of issues. Enjoying the free air, being able to get a very good view of the jungle, and finally chose to go along with a Gypsy, meant for the safari. So, we booked the vehicle and finally started for the safari. After travelling a little while, we entered the forest and in a short while, we could hear the guide saying “Hush.. Signals!! Signals!! Probably there’s a tiger nearby.” There was a huge adrenaline rush within all of us eager to see a tiger for the first time (Of course, Jinal had already seen a few of them abroad, on one of her foreign trips). All eyes popped out in all directions, cameras ready to capture the action, and we hear a hustle in the bushes nearby. All of a sudden comes running a Sāmbhar deer from the bushes. Seeing the vehicle and us in it, it started running away into the bushes even before we could ask it for a pose (I still wonder whether what frightened it was the vehicle or us). Disappointed, in fact, more disappointed for not seeing a tiger, we proceeded. On our way, we met more of them which we faintly captured on our cameras. And then, the jeep stopped all of a sudden. The driver and the guide started discussing something in their language and then they showed us something. 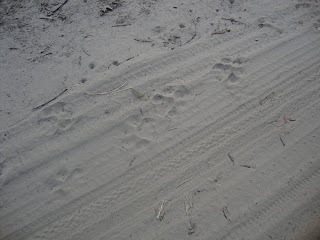 It was the paw prints of a tigress and its cub. They had passed by the same road few minutes ago, for their prints were very fresh and not tampered at all. We were overjoyed seeing it, as if we saw a real tigress. Apart from some shots that we clicked, I even got down from the jeep and took some close ups. 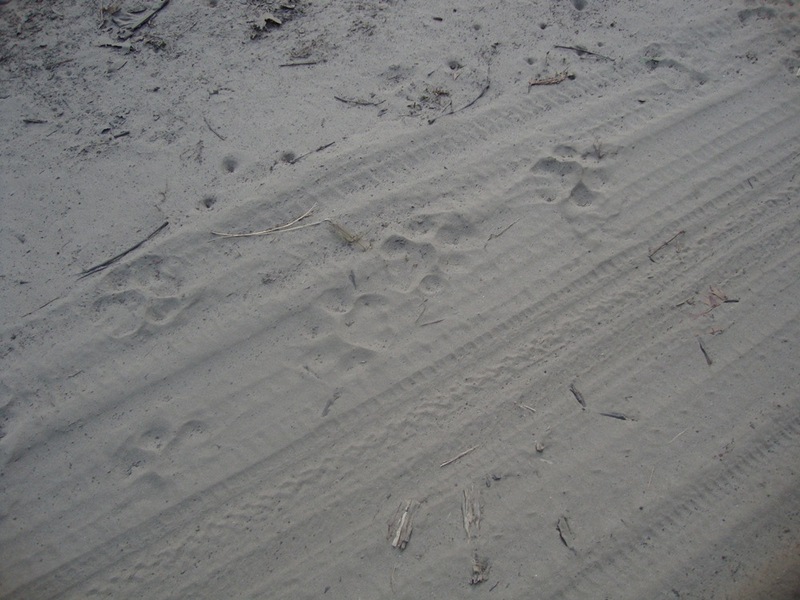 We proceeded quickly hoping to find them somewhere down the tracks, but finally the paw prints disappeared into the bushes after a while. Disappointed, but with hopes high, we went further. 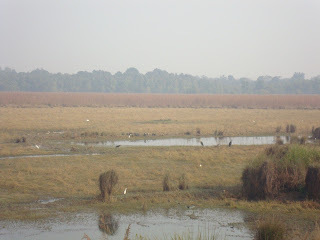 All we saw were some spotted deers, more Sāmbhar deers, and some peacocks. After travelling for some more time, we reached a grassland where the grass was almost 10 feet high. The entire patch of land was golden yellow, and in the distance bordering the grassland, stood a grove of trees tall enough to provide an excellent scenic view. For a moment, I was wondering if we were somewhere in the Steppes or the Prairies, or probably the Downs. We stopped for a while over a stream running amidst, and saw some birds quenching their thirst. Again, clicking some pics, we advanced. 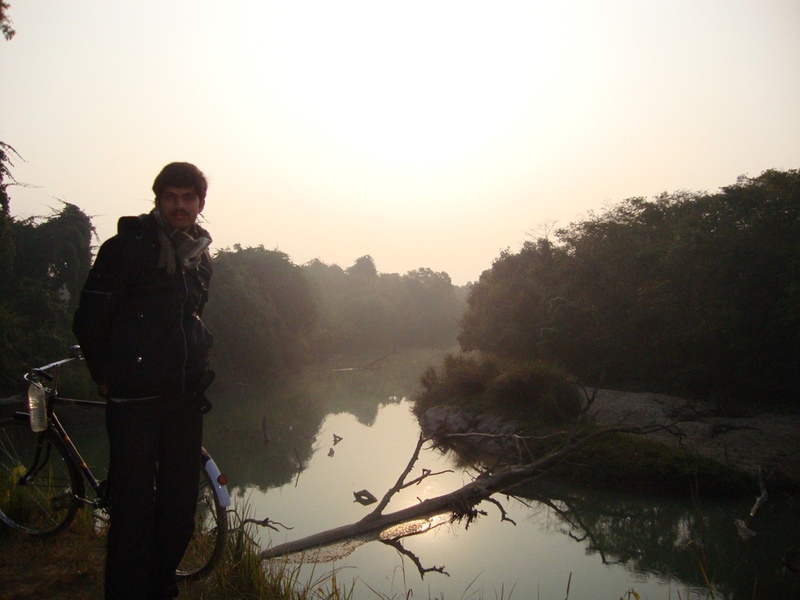 After a while, we exited the grassland and reached a river. We were told that the tigers come here to quench their thirst every morning. So, we waited and waited till we got thirsty, but there was no sight of the royal beast. By now, everyone realized that there’s no point in pinning our hopes on finding a tiger. So, someone said, “Let’s get out of this place guys. I think our campus has more wildlife than this”. As the saying goes, ‘Man proposes and God disposes’, here our driver and our guide were our Gods. 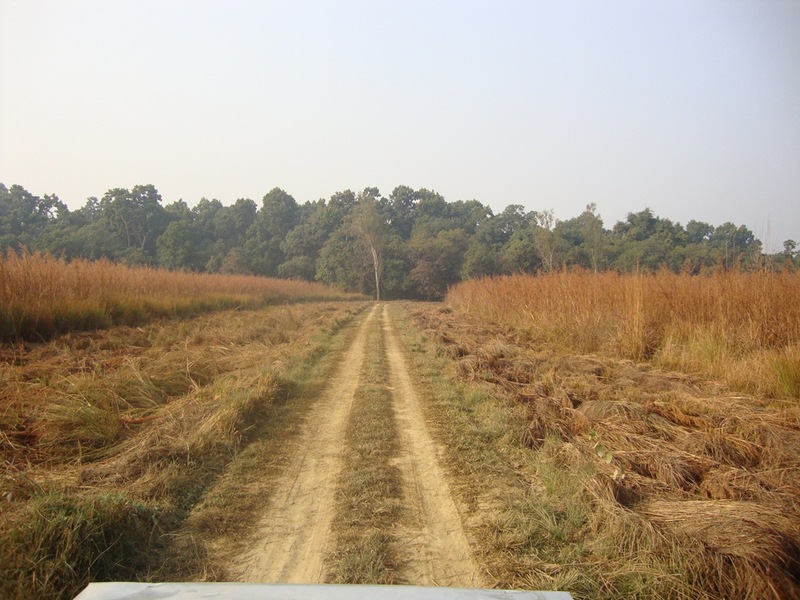 The more we wanted to get out, the more they took us into the interiors of the forest area. Finally, we reached a place where there was a family of about 20-25 deers. The road there was so narrow with branches of the trees blocking it. Fighting against the branches and rocking (as in a cradle) in the jeep, we finally crossed the area and entered a place where there was a huge lake. This one was full of birds, of all kinds. There was an elevated platform probably built as an outpost, which helps bird watchers get a real good view of the lake and the birds in it. we climbed into it, and behind us, came another group. Half way through, they were discussing something about a tiger. Smriti eavesdropped and came to know that they had actually seen a tiger on their way, probably the one whose paw prints we saw. So, she asked them if they did, and one guy in the group showed her, with all due reverence, the pics of the tigress that he had captured on his SLR camera. And suddenly, Smriti was jumping and flying in the air with joy. I suddenly felt on seeing her that she had been riding a tiger, only to realize that she had just seen a snapshot of it on their camera. Cursing my sense of intuition, we came down after capturing a few more shots of the birds. Poor Prashant had to bear all the things that we did to him, for he was talking only to Ravi (his friend who came all the way from Chennai only to see a couple of birds and deers) and none of us. But some funny incidents kind of cooled him down probably by the end of the safari. Jinal and I being photo freaks, got into our own world of getting some photos clicked wherever there was a nice tree, or a nice view, or anything that can be termed nice in our words. This was further delaying our plans of going back. He was probably getting irritated, but then had no one on whom he could vent his frustration. Biting his teeth, he remained mute, muteR and muteST. We went on until our batteries were down (both ours as well as our cameras’) and finally exhausted, we returned to the gypsy and continued our journey. Effectively, by this time, we realized that we were probably the ones on the other side, as in, the animals came out to see us, more than we went in to see the animals.